If your limited and short budget is not allowing you to buy your favorite pieces of furniture and decor than you are just at the right place you should seek help from. 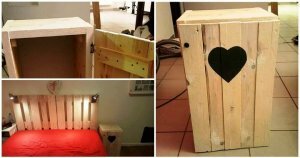 Here we are going to show the cheapest yet completely DIY Pallet ideas to build your desired furniture range of your own and get your homey sections properly filled. And there is only one thing behind the cost efficient and practical gain of your favorite pallet projects and furniture decor pieces and that is Pallet Wood. Using this re cycled wood you can realize many things from your wish list that you have listed for your house. Even today we are here with a bunch of these DIY pallet furniture ideas for indoors to let you grab the most neediest and important furniture possessions. Dining tables, coffee tables, wine racks, dining table set you would have them all right below to get peek into and boost up your pallet inspiration. Getting handy with pallets and your tool kit you can get any of these or all of these pallet creations in your home and make it a more practical luxury place than it ever was. So do browse them all to know the capability of the pallets and challenging your crafting and creativity skills with. To shpe up this lovely clock you would need have to cut down 9 block piece from the pallets and glue them together. Use lots of tighteners to hold all the pieces together until they are tightly and nicely packed. Wait till the glue dries and then fix the clock machinery in the center of the clock as you can see in this picture. The clock has been stained in the rustic brown shade to look that gorgeous and elegant on your hall, living or bedroom walls. Cut the pallets into the plank pieces and them stack them together in the famous chevron style like here it has been done. Then the thick pallet cut bar has been taken and joined to the table as the simple leggy support yet sturdy and strong. Here is how your chevron table would look after the tool work and a well done sanding session all over it. Here the chevron coffee table has been stained in that perfect brown shade to make it look really a shabby chic piece. 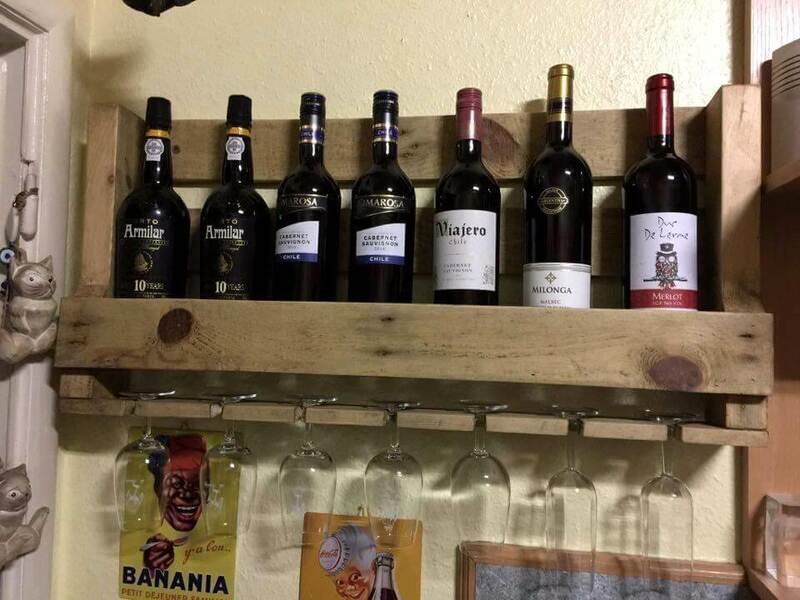 Using the pallet cut slat pieces you an simply shape up this lovely and functional wine rack for you living room spaces to have more fun. This wine rack has all the features like the two racks six glass slots and some stenciled work on top making it more enchanting. If you have high crafting skills then this dining table top would test your abilities as it features a flower like pattern in it. This complex styled metal base leggy support would be holding the dining table top from the pallet on it. Here is how this lovely dining table would look with complete tool work and the sanding session on it. You can stain the dining table per your dining room decor demands and thus make it look rustic, shabby chic or modern. You need to different size pallet plank pieces according to the demand and need of this patterned dining table top and stack them together. Here is how it would look with complete stacking of the pallet piece together using the nails and glue. 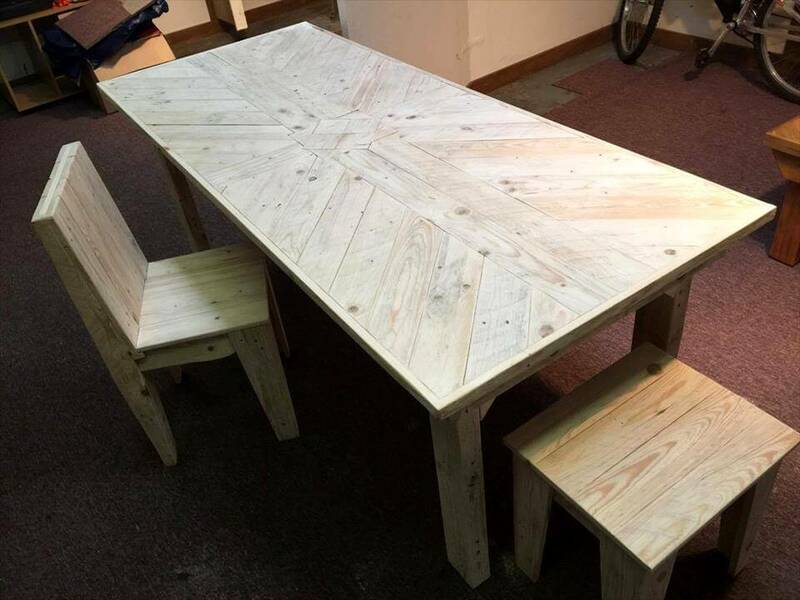 Four thick pallet bar pieces have been used as the leggy support of the dining table as shown here. 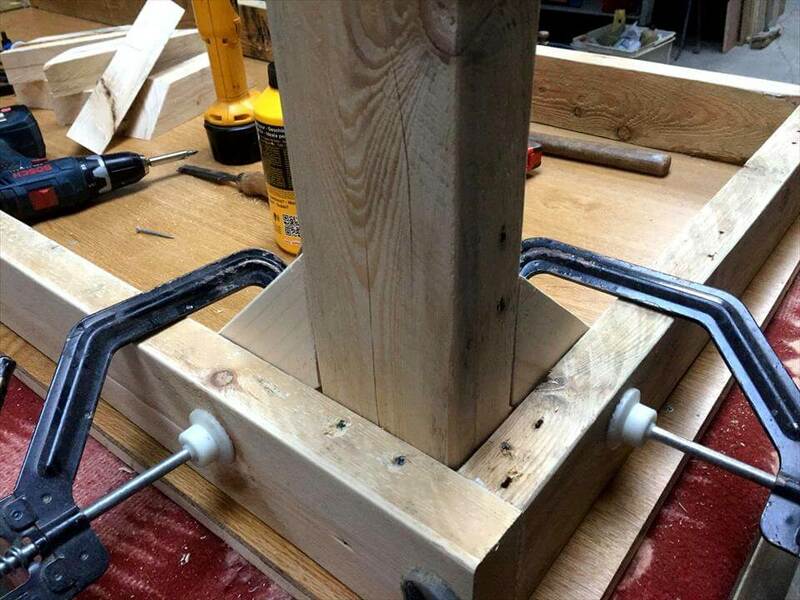 Here is how you have to struggle with the tools to set up the leggy support system of this lovely dining table. To have the seating with the dining table there are chairs and stools and here is shown how firstly the base support has been built first. The back and seat has been built on the leggy support using the pallet cut slat or plank pieces with simple stacking method. You can just cover the leggy support with the seat section and the stool is ready and giving it a backrest it would convert into chair depends on you what you want a chair or a stool set. Here is how your dining table set would look in the initial stage with complete sanding session all over it. The top of the dining table has been stained in brown and the base section in white making it look really a chic piece and so would the seating set stained.